Fill your bedroom with the sweet and whimsical charm of the Urban Habitat Kids Ella Cotton Printed Coverlet Set. 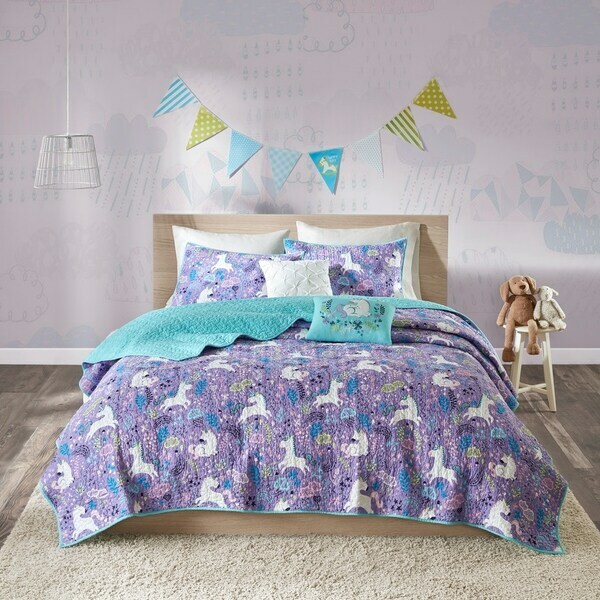 Adorable unicorns prance across the top of the coverlet and matching shams in bright colors on a pink/ purple ground. The solid purple/ aqua reverse highlights the fun print making it pop! Completing this 100-percent cotton coverlet set are two decorative pillows that feature pleating details and an applique unicorn, for a magical finishing touch. Cotton filling in the comforter and hypoallergenic filling in the pillows provide rich softness and comfort. Machine washable for easy care, this child's cotton printed coverlet set comes prewashed and will brighten your bedroom with its fun and playful look. Dimensions 88.0 In. X 68.0 In. X 0.25 In. I prefer bedding that is made from cotton, so I really liked that I found a cute print on a cotton coverlet. I wish the purple color were more of a lavender, but my 5 year old daughter loves it. The colors are great for a kid. My daughter loves unicorns and purple and this is perfect. So far it seems to be good quality and has washed well. I like that it comes with decorative pillows too. My granddaughter loves this coverlet set. She wanted unicorns and she got them along with beautiful color and good quality. Super cute set for my five-year-old daughter's room. She loves the unicorn print and the pretty pillows to match. Also washes and wears well. This was out of stock for a while and my daughter and I were worried it would be discontinued. Overstock sent notice as soon as it came into stock. We ordered full and twin for a bunk bed. The pattern is beautiful...very magical and whimsical. I am very happy with purchase. I have yet to wash it yet but so far so good! My Grandaughter is a unicorn lover. Her entire room is of unicorns. This bed set completed the look. Soft sheets, beautiful colors and pillows. Shipping was fast. She loves it!!! Thanks Overstock. Excellent quality cotton and a great print! My four year old is happy and I am happy. My 5 year old daughter is obsessed with unicorns so this was one of her christmas presents. She loves it!! The colors are bright and very pretty. This comforter will grow with her for several years so it was well worth the money and I have one happy little girl!! Nice, gift was much appreciated! Very nice quality. I would recommend to a friend. Absolutely love this bedding and the throw pillows are adorable. It looks beautiful with light lavender sheets. Good quality, no regrets, and my daughter loves it! I bought this for my unicorn loving daughter’s room, and it’s perfect. It’s such a cute and well made set. She loves it! Really nice quality. The purple color is soothing. Wish the pink one was still available as well. The weight and fabric is very nice. My six year old granddaughter loves it! Looks beautiful in my girls’ bedroom! Vibrant colors, my daughter adored this on her new bed she got for Christmas! Unicorns are the new awesome trend, and this was perfect! "When will this be available? My daughter so wants this set for a new bunk bed in a coverlet not a comforter but I'm having problems finding it. I would like to get it in full/queen and twin for each of the beds. Do you know when it will be in stock? I've already set up notification but she is anxious to know when. Do you have an estimate? And will both sizes be available? Thank you!" "Is this available in full/queen?" Baby girl loves unicorns she’s getting a new room for Christmas! Grand babies love unicorns and the color is perfect for paint color in bedroom. I have been looking for quite awhile and thrilled to find this set. You can machine wash this, however we recommend spot treating the pillows.